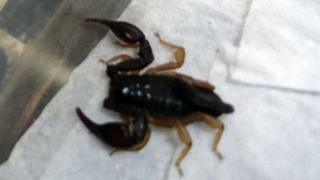 A "feisty" scorpion has been captured at a luxury hotel in Birmingham. Staff at the Hyatt Regency, soon to host part of this year's Conservative Party conference, found the unwanted guest residing on the third floor. They managed to trap it under a glass when it was found on 13 September and then called the RSPCA. Animal collection officer Vic Hurr said the mildly venomous European yellow-tailed scorpion had escaped from luggage. "The scorpion was only small but he was a feisty little thing," she said. "We think he must have come out of some luggage and probably travelled thousands of miles so he certainly had an adventure." The European yellow-tailed scorpion sting is said to be akin to that of a bee. The stowaway arachnid was taken to a specialist rehabilitation centre and will eventually be rehomed with a specialist keeper, the RSPCA said. A number of events at the conference, which starts on Sunday, are being held at the hotel, including a discussion about Brexit and nature being led by Environment Secretary Michael Gove.